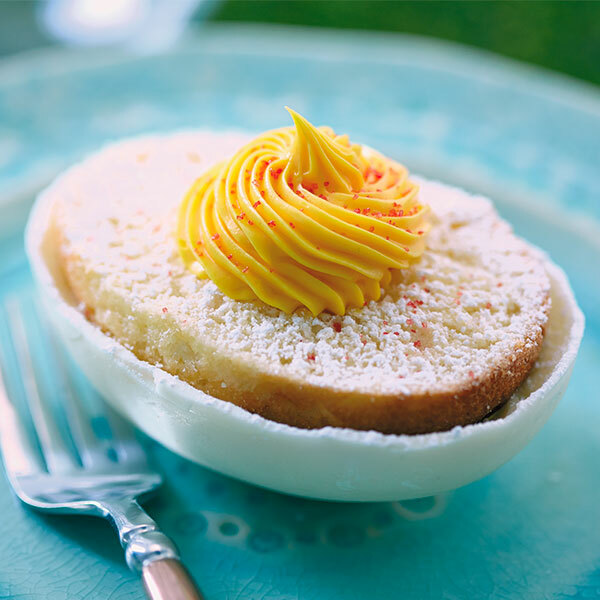 Whip up some fun with these egg-shaped cakes. Made from a white cake mix and canned frosting, this deviled dessert ascends to angelic heights when served in a delicious shell of white chocolate. Your guests are sure to crack a smile when they see these deviled Easter egg cakes on your dessert table! Prepare white cake batter according to box instructions and pour batter into silicone mold. Bake, and let cool completely. Remove cakes from mold and set aside. Wash and dry mold for the next step. For chocolate shells, melt the white chocolate chips in the microwave, stirring every 30 seconds. With a pastry brush, paint a layer of chocolate in each cavity of the mold. Let cool and then repeat with a second layer of chocolate. Set the mold aside to allow the chocolate shells to harden. You can place the mold in the refrigerator, but it may cause some condensation on the chocolate. Carefully remove shells from mold once they have hardened. To assemble the eggs, level the cake tops using a serrated knife. Scoop yellow frosting into a pastry bag fitted with a star tip. Place each cake into a chocolate shell using a dab of frosting at the bottom of the shell to secure. Sprinkle the top of the egg cake with powdered sugar. Pipe on the yellow frosting “yolk” in a small circle at the center of the egg cake. Sprinkle yolk with red sugar sprinkles.